It can begin with one question or interaction. Knowledge. The potential behind knowledge, especially for a middle school student, can seem intangible. “When am I ever going to need to know this?” Here at UWP, we believe the power of combining education with action unlocks potential that truly changes the world! Seventh graders at Clarence Middle School near Buffalo, NY have been taking classroom knowledge one step further to action. 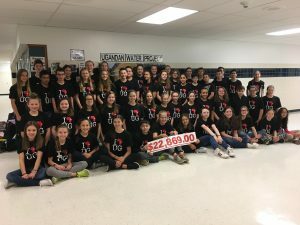 The English Language Arts department pairs their unit on Linda Sue Park’s A Long Walk to Water with media from UWP’s website and a grade-wide water walk fundraiser for rainwater collection systems in Uganda. This collaborative effort allows for the content of their curriculum to come alive, connecting with real world problems and participating in the solution. This partnership came about after a seemingly random encounter at a local Target in the summer of 2013. Lynn Elibol, a seventh-grade ELA teacher at Clarence, was telling a former student about Park’s book. Behind her in line was David Etkin, sixth grade teacher at Sweet Home, a neighboring school 20 minutes from Clarence. His students were also reading A Long Walk to Water at the beginning of their school year! David mentioned that Sweet Home was working with UWP to add a global community service piece to the book unit with a water walk fundraiser. He invited Lynn and her peers to witness the kick-off presentation that fall, which they did. When the CMS teachers saw the excitement of the students, they knew they had to get involved. 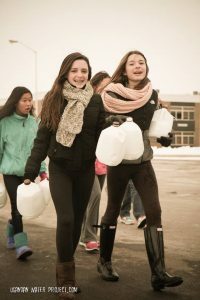 7th grade students participated in their first UWP Water Walk that winter – trudging through snow and braving winds in much the same way Ugandan students must traverse sun-beaten dirt roads half a world away. The collaboration between CMS and UWP has resulted in 4 years of middle schoolers changing the world – a total of 27 rainwater collection systems funded! The passion of these seventh graders has transformed a story and classroom knowledge into life transformation for students half a world away for years to come. Clarence’s legacy doesn’t end here. They’ve already started the 2017-18 school year off with a bang, beginning fundraising in mid-September, holding their Water Walk the first week of October. We look forward to a bright future full of passionate, empowered students who continue to make a mark in the world! Ready to start a campaign at YOUR school, team, or group?